Have you heard of a new subscription service called PopSugar? I had just heard about it from Tiffany over at Iamstyle-ish and signed up for the first box they were shipping out. The folks at PopSugar weren’t very specific on what would be in the box at all, but I signed up for it hoping there’d be some extra special goodies for the first go round…. so what was in the box? This box included 2 health bars, 2 nailpolishes from RGB, 2 lipsticks, a raspberry body scrub and a pomegranate body lotion. Aside from the Kind Bars that were in here, I hadn’t heard of any of the other brands in the PopSugar Must Haves delivery. The lipsticks and nailpolishes were great, I can’t wait to try the body care and the Kind bars are already gone! I’ve already used the totes for lake shore days and quick trips to the grocer, so all in all, everything is being used or regifted- the quality met or exceeded expectation. The box goes for $35 a month, so it’s a bit more expensive than other boxes, but as you can see there are full sized products in here, and the value exceeds $35. I was happy with the box but I didn’t seem to fall in love with it like with Birchbox or other subscription boxes- I should be totally happy with it, but I’m not sure why I wasn’t thrilled. Perhaps it’s because while the products were all full sized and great, there wasn’t that one “winner” product that I can’t live without or was uber excited to try. 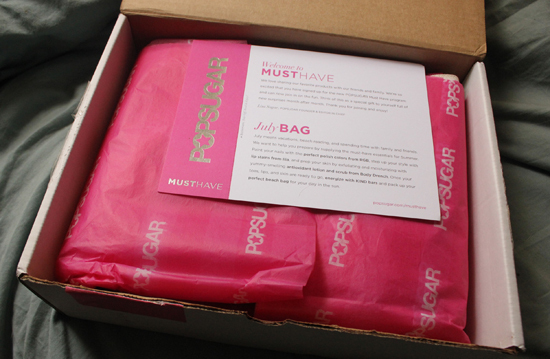 So, should you subscribe to the PopSugar Must Haves Box? I’m sure they’ll be mixing it up for the next box- but I would say, if you want a good value for your money and want to experiment with new colors/scents/shades of existing products you already like to use (the standards) this might be a great way to treat yourself. Also, if you’re looking for a great gift, the product in here seems pretty safe (not crazy skin care products, self tanner or wild colors) enough to give as a present for someone else. Otherwise, if you’re more of an adventurer with your product and subscribe to beauty boxes in order to play around with new products and discover new items, this might not be the one for you. If you’d like to subscribe, feel free to use my link to subscribe to PopSugar. Thanks! Have you tried the Pop Sugar Must Haves Box? Can you recommend another box I might like? I think I may have to check this out! I’ve done a few different boxes in the past but I like Julep Maven and Birchbox the best. Ya, I think it’d be worth a try, I thought it was a nice inaugural box. The only products in this box that I’ve tried are the KIND bars.. and I love them! Everything else in the box sounds great too! KIND bars are ahhhmaaazzinngg SO good they really hit the spot..the rest of the products I hadn’t heard of but I am hoping they’re good! Try KLUTCHclub. I love it! Oh that review is going live here in a bit… I have heard great things! I have not heard of suscription boxes before! I guess these are a good way to get brand new products out to a wide audience base. I haven’t hear of this either! How cool. Will look into it a little further. Thanks for the post.